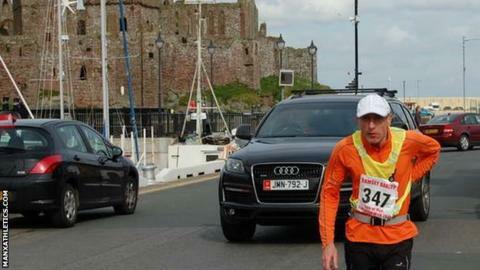 Mike Readshaw won the End-to-End Walk in the Isle of Man in a new personal best time on Sunday. Despite a strong head wind Readshaw completed the 39.2 mile course in six hours, 57 minutes and 24 seconds. Stephen Harvey finished second, 17 minutes down on Readshaw, with David Walker third. Janice Quirk returned to competitive action to take the women's title and fourth position overall. The event is held on long stretches of paved roads passing through Bride, Jurby and Peel before climbing up to Cregneash in the south of the island and ending at the Sound. More than 300 walkers took part in this year's event.